Radhika Thanedar focuses her practice on the defense of litigation matters, with an emphasis on personal injury and property damage litigation. Ms. Thanedar is involved in all phases of litigation including, discovery, drafting motions and appeals and case evaluations. Ms. Thanedar joined Hinshaw & Culbertson LLP in July 2017. Prior, she served as a law clerk for a San Francisco firm and held an internship with the Department of Communications and Legislative Affairs at the San Francisco District Attorney's Office. 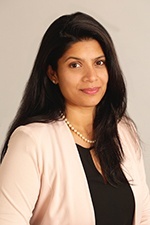 Additionally, Ms. Thanedar spent more than two years practicing as an attorney with several firms in Mumbai, India. During law school, Ms. Thanedar gained invaluable experience through the wrongful conviction clinic at Duke University.